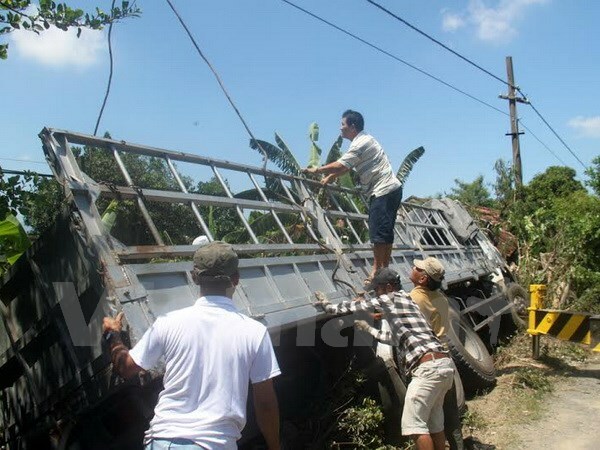 NGHE AN (VNS) — Six people died and two people were injured in three separate traffic accidents reported in the central Nghe An, Phu Yen and the northern Yen Bai Provinces this morning. Two women died after a truck collided with their motorbike at an intersection between National Highway 1A and the Vinh City side route in Nghe An Province's Nghi Loc District. In central Phu Yen Province, a man died and two people were injured after a car from the Hoang Phu Transport and Commerce Company skidded out of control, hitting a motorbike coming from the opposite direction and then mowed down a woman standing on the roadside.